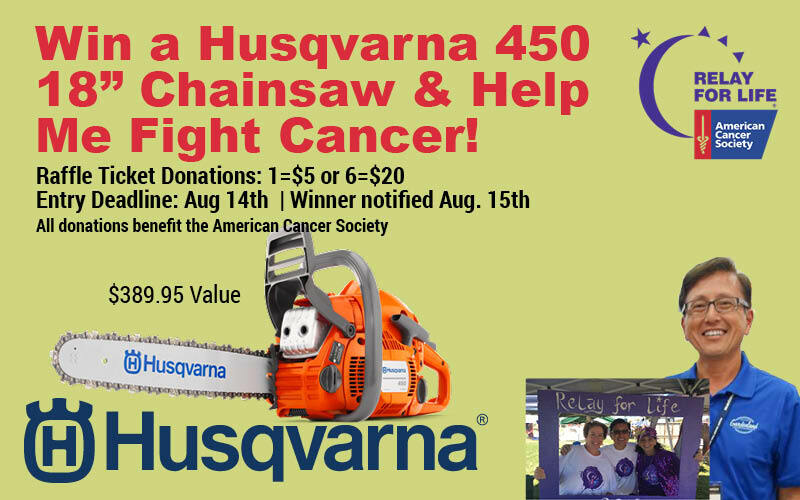 Register to win a Husqvarna 450 Rancher chainsaw and help fight cancer! Brian Santo from Gardenland created the Relay for Life raffle drawing as a fundraising activity to raise donations and awareness to fight cancer. Brian lost two family members and a close friend in 2016 to cancer. You can buy raffle tickets at Gardenland or online, and raffle tickets cost $5 for 1, or $20 for 6. Entry deadline is August 14th and a winner will be select on August 15th. Last year Brian raised $1,335 in donations to fight the deadly disease. Thanks to Husqvarna and Gardenland for the support!